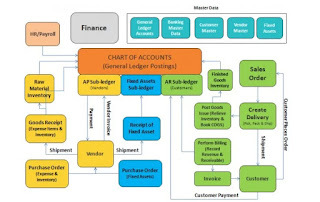 Its configuration touches both Finance and Sales & Distribution modules. 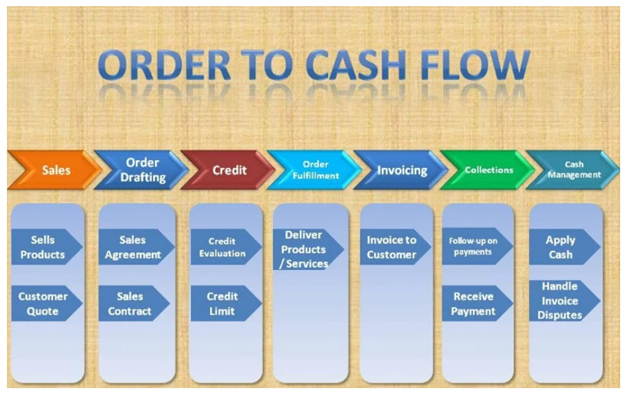 This is an end to end process from customer Inquiry to goods delivery, billing and payment of money. The process starts when a customer inquires for an inventory item (finished goods for a company). The customer gets quote for the item and place an order for the quantity needed. A user from company place the order and pass it for processing. Inventory gets picked up from warehouse and shipped to customer. Billing process also starts with delivery and it can be sent with the item or later. This is an overall OTC scenario in general. ·Inquiry : A customer inquire about the product price and service. This is a very starting point of OTC process. 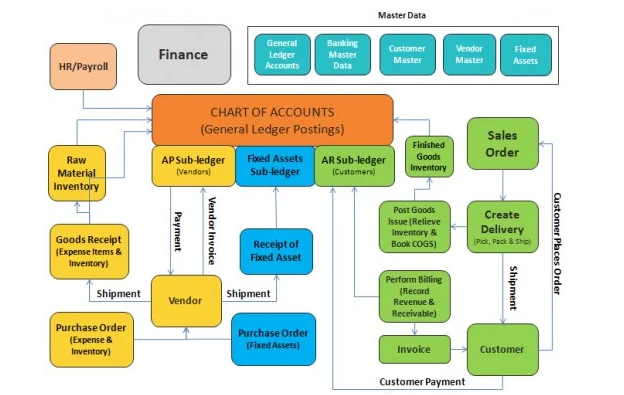 This process does not have any effect on general ledger accounts and do not have any accounting entries. Once a customer creates inquiry, an inquiry number is generated. Inquiry is created by transaction code VA11. ·Quotation: Quotation is a price quote given to the customer. A quotation follows inquiry steps. A quotation can be created via inquiry or without inquiry reference number. A quotation is created by transaction code VA21. 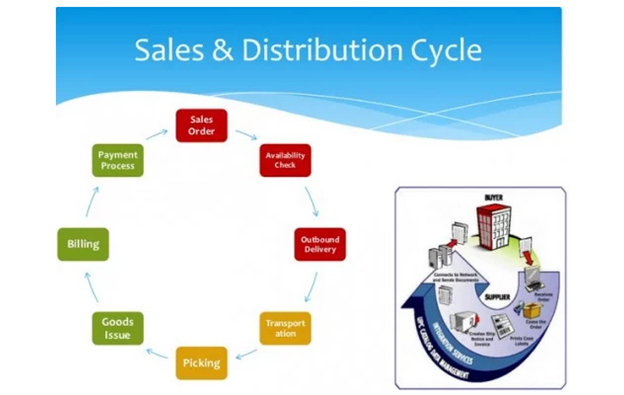 ·Sales: According to some SAP experts, Sales order is actually the first step of OTC process. After inquiry and quotation, once it's gets created. 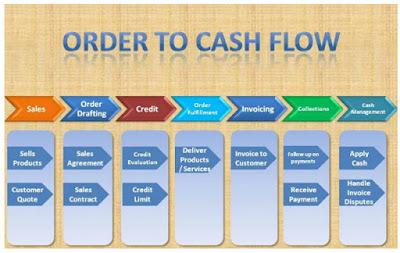 Sales order can be created with reference of quotation or without reference. It does not make any accounting book entry and it does not make any change in General Ledger accounts. It is just a commitment to deliver goods to the customer. SO can be created with transaction code VA01. ·Post Goods Issue: Post goods issue is the steps where goods are being picked by warehouse, packed and shipped to the customer's given shipping address as per the sales order. We have accounting entries as inventory is being credited against the cost of goods sales (COGS) debited. General ledger accounts associated with the cost of goods sales and inventory is affected respectively. ·Delivery: Delivery follows post goods issue (PGI).Delivery is the actual fulfillment of goods to the customer shipping address. At delivery stage, we have accounting entries in the books. At this stage, we debit revenue account and credit customer account. Transaction code for delivery is VL01n. ·Billing: At billing stage, we send the bill to customer for the goods delivered. We have accounting entries at this stage where we debit customer and credit cash account. 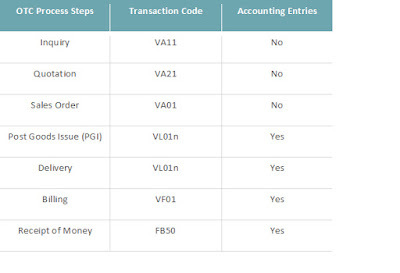 Transaction code for billing in SAP is VF01.